Home Biafra Featured Nigeria JUST LISTEN! Uchenna is a friend around my age, he hails from Ọmọkụ Rivers State. As you must have known, an adult Rivers indigene is political by default. I don't mean to throw shades but I just want to be exact. Political Otimpku is a ritual here, if you are not discussing Wike, you are talking about Amaechi or the caretaker committees or political choppings. 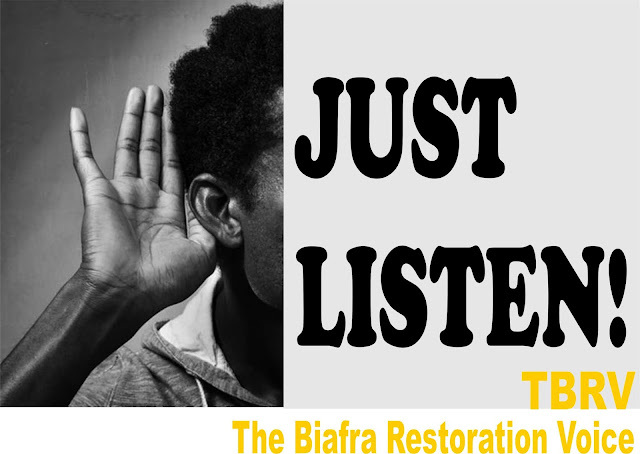 ​Most folks here in the South-South hardly have any ears reserved for Biafran talks. Despite most also being genealogically Igbo, they believe that they stopped being Igbo the day Rivers State was hurriedly created and most Igbo nations affixed to other tribes so as to make Ndị Igbo control lesser oil and have a lesser mass. The last blow that made the centre fall apart was the creation of the geopolitical zones, here Ndị Igbo were given an alias called Southeast which makes up five states. Uchenna also thinks he is not Igbo. I have sworn never to be found in that identity crossfire, and I have truly kept it that way. I have always asked myself a question, and that question is, those who deny being Igbo, using true judgments, based on poverty index and living standards, are they better than those from the southeast geopolitical zones? That is for you to answer. Every time MNK wraps up a radio program, I always demand for the recorded audio. So, one day, I was by myself listening to one of his broadcasts with all penchant. The sound was soaring from the speakers of my phone. Uchenna was some few meters away but could still make do with some audibility as he fingered his phone with divided attention. As the audio of the broadcast was still playing on my phone, a call came in, the call was for a business I had to deliver. After the call, I stopped the audio and made a stride when Uchenna asked if he could get the audio before I left, I was gobsmacked as I was trying to make a meaning of what he just asked. I was like, why would you want the audio? Biafra is not your thing and Nnamdi Kanu is just a rabble rouser and we Biafrans are noise makers, why would you be interested? There and then, he told me in a rather cold and contrite voice that he has never listened to MNK but has always based his perception of him and the struggle on words on the street. He asked me, "Alex, why do people hate this guy na?" "What he is saying are facts" "Alex, do you know that many people have not actually listened to him before but already have a made-up mind?" "This is not cool man." I transferred the audio to him via WhatsApp as I hurriedly went for my urgent business but I promised him that we shall talk more when I am chanced. 5:17pm Saturday last week, he called me to remind me to tune in as he was already beside his radio and on Facebook as a contingency. He now has a passion just because he listened. There is God and there is Satan. There is light and there is darkness. There is triumph and there is failure. God has said that good will always triumph over evil. Darkness is not an entity but an absence of an entity called light. When light comes, darkness must give way. Be steadfast and continue to be the light that you are because victory is ours.